This book is based on Ayurveda, the ancient healing science of India, by a Westerner first ever to obtain a degree in Ayurveda. It is meant to reintroduce modern man to 'walking with naked feet' through life to come back into contact with Nature. Although centuries old the concept of individual constitution is a new concept for the modern mind, a new way for all of us to understand our 'relationship' with nature. Ayurveda is above all meant for all people who by harmonizing themselves seek to act as harmonizing forces in the universe. Ayurveda is the product of a civilisation which is deeply rooted in Mother Nature. Through this book we can overcome the Nature's ire and restore to vitality of natural health by shunning overweening, arrogant passion for self-indulgence. Nature is part of the individual, since we all are created from, exist in, and return to nature. Nature is always magnanimous, and She will be as generous to you as you are generous to yourself and to other beings. You cannot buy, beg, borrow, or steal health; it is Nature's gift to you. Actually all of us have a Mother in Nature and only She can lead us to happier and healthier life. Robert E. Svoboda graduated from the Tilak Ayurvedic College of the University of Poona in 1980 as the first and the only Westerner ever to become a licensed Ayurvedic physician. He is on the staff of the Ayurvedic Institute in Albuquerque, New Mexico, and divides his time principally between North America, Hawaii and India. In India, where he has lived for more than a dozen years, he continues his research into Ayurveda and other ancient sciences. Since then he has travelled extensively, lecturing and conducting. He is the author of several magazine and journal articles, of the Ayurvedic Home Study Course; The Hidden Secret of Ayurveda and Aghora: At the Left Hand of God. Excellent introduction to the field of Ayurveda,with special emphasis on the constitutions. Dr. Robert Svoboda is the first and thus far the only Westernerever to obtain a degree in Ayurveda. He graduated from the Tilak AyurvedaCollege, where Dr. Vasant Lad was one of his professors, in Poona, India, in1980. Since that time he has travelled extensively in the U.S. and Canada, lecturing and conducting workshops on the subject. This book covers the subject of Ayurveda very deeply and takes us on a journey into understanding Nature or Prakruti and more specifically our own nature. What are te components that make our physical and mental make up and how this reflects upon our Ayurvedic constitution. Dr. Svobodas writing style is always humerous and flowing and takes you into the heart of the very subject. 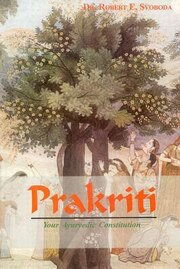 The book not only covers Prakruti but covers many aspects of Ayurveda and is a brilliant book of introduction for someone wishing to go deep into what is Ayurveda. Not just the medical system but the system of understanding life, manifestation of consciousness and our journey through it. I truly love the way that Robert Svoboda shares his deep insights into Ayurveda with the world. He is an amazingly clear and eloquent writer and he weaves the poetry and magic of Ayurveda into print. He's well schooled in Ayurveda and also in it's Gurukul tradition as he studied with the Aghori master Vimalananda in Mumbai for many years which gave him the deeper insights into this art of living. This book is very readable, very enjoyable to refer to and has a lot of depth and insight for every student of Ayruveda on any level. I truly love the way that Robert Svoboda shares his deep ins ..